So Liz claims victory again! She’s getting to be quite the contestant! But she’ll need all her knowledge this time. On this show the contestants challenge themselves on superlatives! Those comparative structures that tell us when something is outstanding in a particular way! Will Liz make it through again? Can you answer our questions? Who’s this rather important-looking character? Find out in this episode of the Grammar Gameshow! Hello, and welcome to today’s Grammar Gameshow! I’m your host, Will! It’s what separates us from the beasts! And of course, let’s not forget Leslie, our all-knowing voice in the sky. Superlatives! Those comparative structures that tell us when something is outstanding in a particular way! It’s nice to meet you. Reginald Fortescue Smythe the Third. Fortescue Smythe the Third… yes. So nice to have a little bit of blue blood around here. Makes a change from the riff-raff we usually get. Are you actually related to the royals? 4962nd in line. Yes! I say! Eh, what what? OK! Let’s get going and don’t forget you can play along at home too. Our first round is a quick-fire round. I’m going to give you some adjectives and I want you to give me the superlative form. Ready? Posh. Jolly good! Superlatives are used when one thing or person in a group is outstanding in some way. To make a superlative, modify an adjective. If it has one syllable, add 'EST'. If it has two syllables, it may take 'EST' or 'most' or either! Check a dictionary. If it has three syllables or greater, we add ‘most’. The last group is irregular, such as ‘best’ and ‘worst’. Well done both of you! Have 15 points each. Hang on a moment… Now, I do hope none of those superlatives were directed at me, eh what what? At you, sir? Heaven forbid! I mean, you are blue blood after all. I like the cut of your jib, young lad, eh what what? Why, thank you, sir. Let’s move on to our second round. We often use the word ‘than’ in comparative sentences, but what ‘th’ word do we often use in superlative sentences? We use ‘the’! Will is the best! Flattering and correct! Very good. Now, which other type of phrase commonly goes with a superlative? A prepositional phrase. Will is the best person in the world! Stop it, you! This is the last question of this round. When do we use a prepositional phrase beginning with ‘of’? Is it something to do with using a plural noun? Well done! We almost always use ‘the’ in a superlative phrase. If we wish to define the superlative further with a group or place, we can use a prepositional phrase. If the place or group is singular, we usually use ‘in’. For example, …in the world. Before a plural, we can use ‘of’. For example, he’s the fastest of them all. Good work Liz… have twenty-eighty-sixy points for you. I say… should she be answering before me? I am royalty, you know! I’m sorry, sir… but she was quicker than you! But she’s… a member of the public, eh, what what? My apologies, but that’s the game, eh, where why? Let her have this one, eh, who who? I mean, she’s one of ‘those people’ after all. Ah, yes, of course. Eh, what what? Exactly, which which! On to our third round then! Which verb form can be used to complete all three of these sentences? a) She’s the youngest person _______. b) We need the best-qualified candidates _______. c) This the most expensive coffee _______. She’s the youngest person to fly around the world. Spot on, eh, what what! After a superlative, we can use an infinitive to further define the noun – much like a relative clause. For example, we need the best-qualified candidates to do the job. Well done Liz. Another sixty points for you. And that brings us to the end of today’s Grammar Gameshow. Let’s count out the points. And the winner is… Liz! With 4962nd in line for the throne points. Well done, Liz! Here’s what you’ve won! Fortescue Smythe the Third, yes. How does it feel to lose to the great unwashed? Oh, it’s not so bad. She put up a good fight. I do have one request, though. Do make sure they are the poshest animals you can find, please. Pure pedigree? Daddy always wanted me to fall in a war. For King and country! Superlatives are adjectives that we use when something is outstanding in a particular way. John is the fastest person I've ever seen. Be careful! There are many two syllable adjectives in English that can be correctly used as type one or type two superlatives! 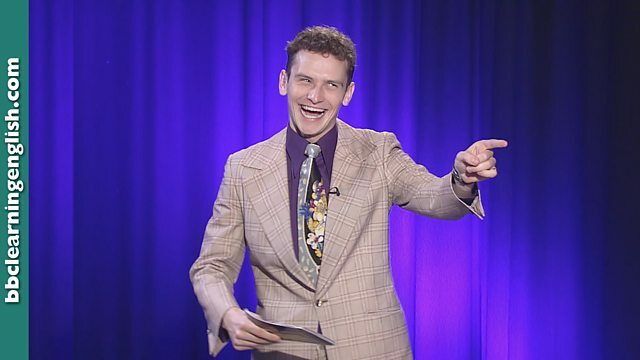 Type 1: Will is the handsomest game show host. Type 2: Will is the most handsome game show host. If the adjective has one syllable, or is one of the certain group of two-syllable adjectives, add 'EST'. In sentences we often precede a superlative with the word 'the'. If we wish to define the superlative further with a group or place, we can use a prepositional phrase. If the place or group is singular, we usually use ‘in’. For example, …in the world. Before a plural, we can use ‘of’. For example, he’s the fastest of them all. It the coolest thing I've ever seen. You're the most intelligent girl in the room. He's the least friendly of them. After a superlative, we can use an infinitive to further define the noun – much like a relative clause. She's the youngest person to complete the marathon. In sentences we often precede a superlative with the word 'the'. Which of these sentences incorrectly uses a superlative? If we wish to define the superlative further with a group or place, we can use a prepositional phrase. If the place or group is singular, we usually use ‘in’. For example, …in the world. Before a plural, we can use ‘of’. For example, he’s the fastest of them all.